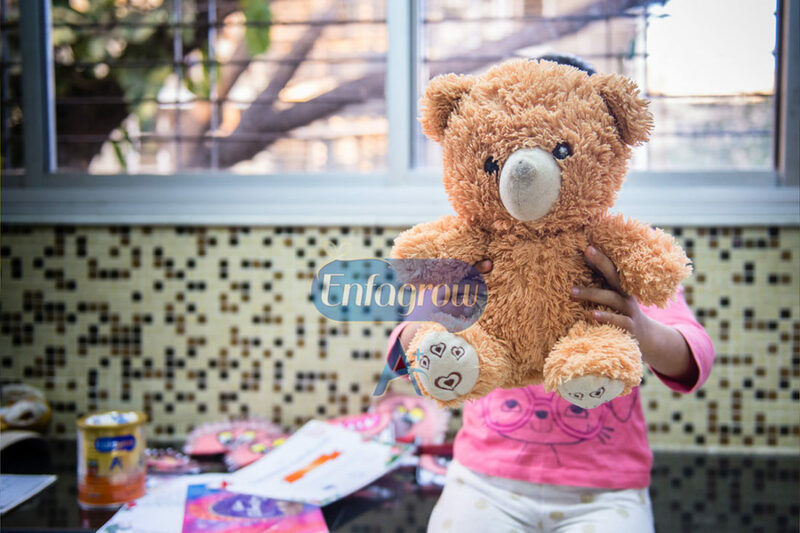 I was recently approached by Enfagrow A+ as they wanted me to be a part of their initiative of spreading happiness this Christmas by gifting toys and storybooks to an NGO (in addition, they will also distribute Enfagrow A+ tins, clothes and educational toys). I was hesitant at first as it involved getting Kabir to give away one of his favorite toys. I was pleasantly surprised when I asked Kabir, he picked up his all-time favourite truck and handed it over to me happily. I can’t deny that I felt really proud. Sharing teaches children about compromise and fairness. Children who share also learn how to take turns and negotiate. It teaches them how to cope with disappointment. Children learn how to make and keep friends. It makes them understand about their abilities, preference and intentions towards others. These are all important life skills. By the age three, many children begin to understand turn-taking and sharing. Apart from sensitising them, nutrition plays an important role in child’s physical and emotional development. Enfagrow A+ is a fortified nutritional powder for 2+ and it fulfils macro and micro nutrient requirements for the overall development of a child. 1) I didn’t rush to be a Referee – I let Kabir and his friends handle the situation for most part. And most times they would continue playing without a fuss. Part of learning to interact with others is figuring out how to manage difficult situations. So, giving your child a chance to improve his own problem-solving skills I feel is critical. 2) Complimenting kind behaviour – If the children did manage to handle the situation on their own, I pointed it out and appreciated it. While it’s important to correct bad behaviour, it’s even more important to praise the good without going overboard with it though. 3) Share with Kabir – I did a lot of conscious sharing with Kabir. I shared the snack from the same bowl instead of having two separate bowls and took turns to play with blocks etc. 4) Sharing with other adults – At home, I would look for opportunities to share things with my friends. Children are great observers and imitators so it’s your best bet. And even if you are struggling with your toddler, don’t get too worried as by the time they start school, kids begin to understand that other people have feelings too. They become much more patient and tolerant then and are keen to do the right thing and can form more complex relationships, which really helps with the idea of sharing. But we can always start with setting an example for them this Christmas by asking them to start sharing. 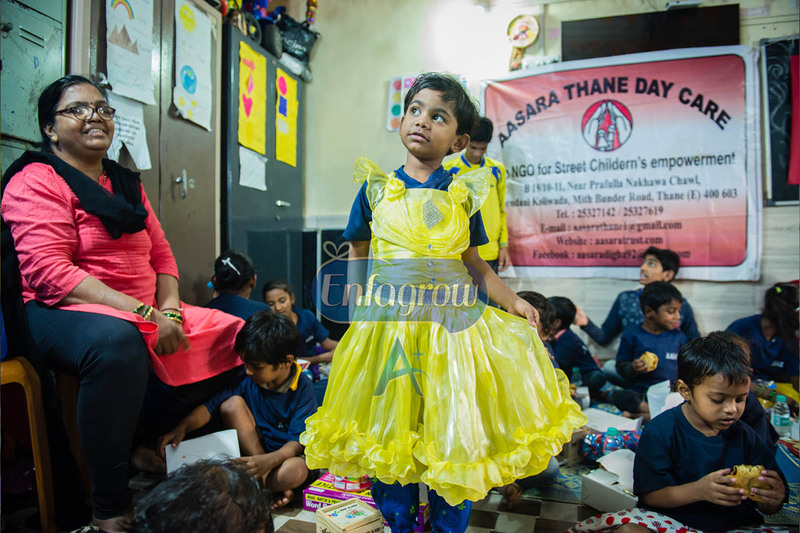 Note – Aasara trust is a day care in Mumbai, which supports street children while their parents are at work. As a part of their Christmas initiative, Enfagrow A+ collected toys and books from the willing parents & their children and distributed them along with new toys, clothes and Enfagrow A+ tins to provide for nutrition needs of the kids who need it the most.